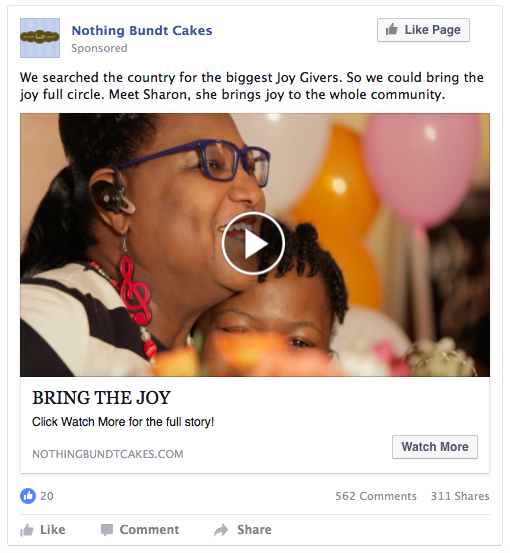 This month, rapidly expanding bakery gift chain Nothing Bundt Cakes (260 bakeries in 36 states, largely Nevada-to-Texas-to-Georgia, and adding about 30 – 40 more per year) breaks its largest-ever campaign. 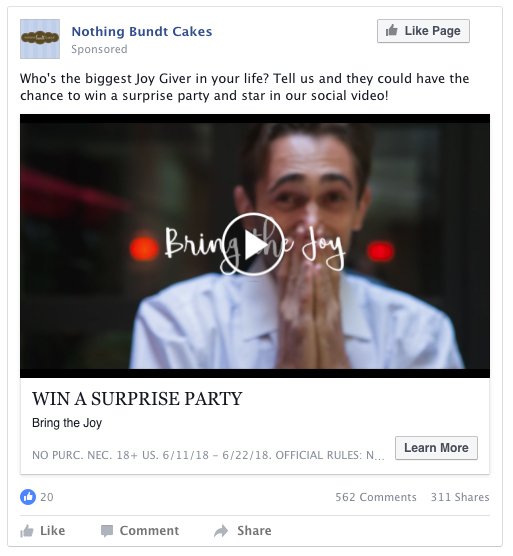 Titled “Joy Giver,” the campaign adapts familiar social activiation media and tactics (a paid Facebook contest) to yield a brand-building end result. It is the first brand-building work by advertising agency 3Headed Monster, Dallas, for their ongoing client (previously promotional and activational only). Communities were asked, via paid Facebook video, who is your greatest “joy giver”? 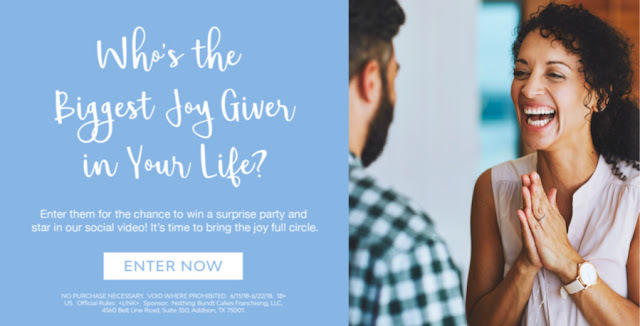 Over 1100 different people were nominated by their friends and co-workers for the chance to have Nothing Bundt Cakes host them an elaborate surprise party. This was the “activation” stage of the campaign. Realtor Holly Tomlin and church choir leader Sharon McGrill, in Tampa and Dallas respectively, were selected, and their parties were filmed. The (unstated) branding message is that “Cakes are communal joy.” Two 2-minute documentary-style videos, one of each party, are touching (and show some pretty-looking cakes). The documentaries will run on paid Facebook, capitalizing on the activation stage viewership, and augmented by additional media targeting women 25 – 55, especially “thoughtful gift-givers,” via Ansira, Dallas. There will also be :30 “teaser” cutdowns of each long video, also on paid Facebook. Strategically, 3Headed Monster notes that social activation has been key to Nothing Bundt Cakes’ growth, and that brand-building, which typically requires TV-type media reach, has been beyond their means. The point of this campaign was to accomplish both. Nothing Bundt Cakes, Addison, Tex., privately held, privately held, offers decorative cakes, also available online, and, in-store only, gifts such as greeting cards, candles, utensils and serving platters. 3Headed Monster, in Dallas, is a full service, integrated advertising agency with other clients including Travelocity, Soraa (lighting), Fetch MD (app) and The Gents’ Place (men’s grooming chain). 260 bakeries in 36 states (largely Nevada-to-Texas-to-Georgia so far), and adding about 30 – 40 more per year. Nothing Bundt Cakes sought out the country’s two greatest “joy givers” and gave each an elaborate surprise party. 3Headed Monster’s first brand advertising for the client, and client’s first such ever (previously promotional efforts only). Also Nothing Bundt Cakes’ largest-ever campaign of any kind. Communities were asked for nominations, via paid Facebook video. 1100 different “joy givers” were entered. Two 2-minute documentary-style videos, “Holly” and “Sharon,” plus :30 cutdowns of each. Surprise parties held for realtor Holly Tomlin and church choir leader Sharon McGrill, in Tampa and Dallas respectively, are touching. Cakes are served. Social activation has been key to NBC’s growth. Brand-building, typically via TV, has been beyond their means.